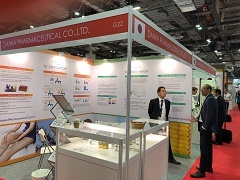 Daiwa Pharmaceutical Co., Ltd. exhibited at “Vitafoods Asia 2018 (Singapore)”. This was a large-scale exhibition for the industries of dietary supplement ingredients and products in the Asian region. It was held at Sands Expo & Convention Centre, Marina Bay Sands (Singapore) from September 11 through 12, 2018. This year it was very successful, featuring about 300 exhibitors from all over the world, including South Asian countries like Singapore and Thailand, European countries like France and Germany, the U.S., and Russia. Daiwa exhibited its products, and received many inquiries from participants. Daiwa will continue to make efforts to further develop its market in the rapidly growing Asian region.